How do you keep 130,000 guests safely entertained, fed, watered and informed in a sustainable way? Roskilde Festival knew that the critical insights lay hidden in huge volumes of real-time data. 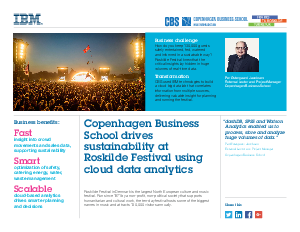 The Copenhagen Business School used IBM technologies to build a cloud big data lab that correlates information from multiple sources, delivering valuable insight for planning and running the festival.